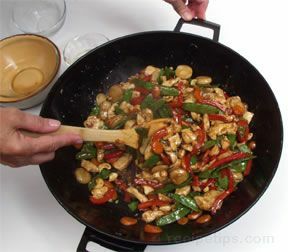 Stir-frying, like sautéing, is a cooking method that quickly cooks the chicken in a little oil, using high heat. The difference between the two methods is that sautéing cooks serving size pieces of meat and stir-frying involves cooking smaller size pieces that have been cut into strips, cubes or diced pieces all similar in size. Stir-frying generally includes meat and other food ingredients cooked at different intervals, which are added together at the end of the cooking process to make one dish. They are cooked according to how quickly each food cooks, with the quickest added last. Generally the process starts by cooking the chicken and the slowest cooking vegetables first, such as carrots, cauliflower and onions. Then vegetables such as broccoli, green beans, peppers, sugar snap peas, and snow peas are added after the first ingredients have been stir-fried for several minutes. A few minutes later vegetables, such as mushrooms, celery, peas, and scallions, are added. Any fresh herbs should be added at the very end of the cooking time. Fruits are also used in many stir-fry recipes and should be added as directed. Stir-frying is a fast paced cooking method so it is important that everything is ready before beginning to cook. Oil, chicken, vegetables, seasonings, and sauce ingredients are pre-measured and placed within easy reaching distance. 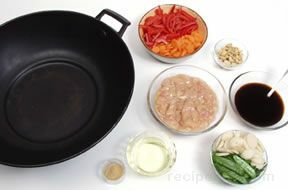 The pan used for stir-frying should be a heavy skillet with deep sides to allow the ingredients to be stirred and tossed without being spilled over the edges of the pan while cooking. 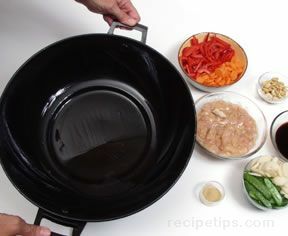 A wok, which has deep tapered sides that make it easy to stir and toss the ingredients as they are cooking, is a traditional pan used for stir-frying. Although a wok works well, it is not a necessity. Using a nonstick deep skillet also works very well. Before starting the cooking process, be sure the chicken and all other ingredients are cut, measured and within easy reach. When the pan is hot, add the chicken and the ingredients that require a longest cooking time, making sure all are exposed to the oil and the hottest area of the pan. Cook on high heat for several minutes, constantly stirring and tossing until the chicken is almost done. It will be just barely pink in the middle when cut into. 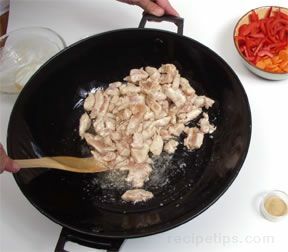 Remove the chicken from the wok, set it aside and cover lightly to keep it warm. Add the next ingredients according to the recipe and cook until just tender, stirring constantly. 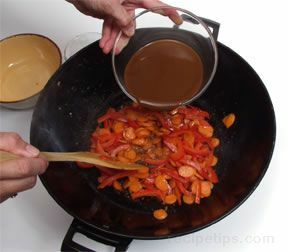 Add the stir-fry sauce according to the recipe and heat until hot and bubbling. At the end of the process, the chicken and all other ingredients are added and cooked on high heat until the chicken is completely cooked. The other ingredients should be tender but still have a crunchy texture. The mixture should be heated thoroughly, but not overcooked. Once it is done, it should be served immediately. To make the cutting of chicken into thin strips easier, place chicken in the freezer for about ¾ to 1 hour to firm it up or if the chicken was frozen, cut it into the thin strips before it is completely thawed. After cutting the chicken into thin strips, be sure to properly clean the work area. Wash the cutting boards in hot soapy water after each use and use a mild bleach solution periodically.